The glorious Cartagena weather is one of the many things that attracts so many people to this city. The city enjoys (or endures depending on your heat tolerance) year-round temperatures in the low 30Cs and almost never falls below 20C, even at night. This intense heat can feel very oppressive at times particularly between around 10am and 3pm when shadows are hard to come by, even in the narrow streets of the city's colonial quarter. Sunglasses, a hat and a decent factor sunblock are therefore an absolute must. Drink plenty of water as well as to avoid becoming dehydrated. Remember that you become dehydrated long before you feel symptoms like dizziness so keep swigging back water at regular intervals. In the tourist areas there are people everywhere selling chilled bottles of water at a couple of thousand pesos a time. Most hotels in the city, even many of the cheaper ones, include a pool which is ideal for cooling off in. Try to plan your days so that you do the majority of your walking early-mid morning and late afternoon to avoid the punishing sun at its strongest between 11am and 3pm. It's a great excuse to find a nice restaurant, cafe or bar and sip a few drinks for a couple of hours in the middle of the day. Cartagena experiences two short tropical wet seasons each year. The first is from April to May and the second is from October to November. During these months expect heavy showers in the afternoon. 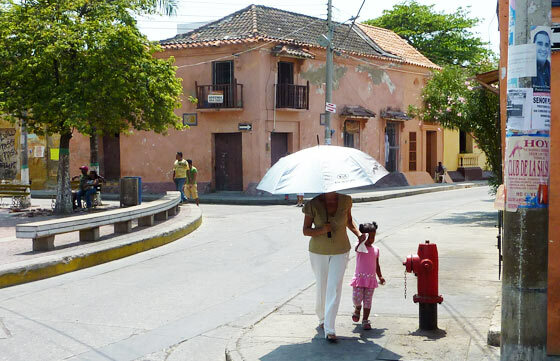 The driest months in Cartagena are usually August and September. From November to February city often experiences windier conditions making the city a little more bearable for those less accustomed to the intense heat. Find out more about the city in my main Cartagena guide.